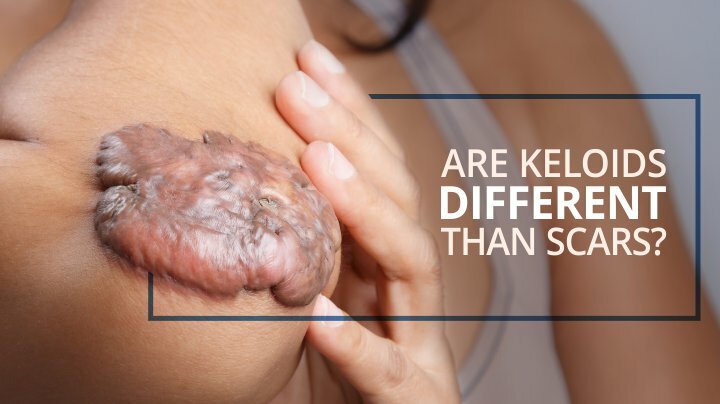 You Are Here: Home » Dr. Dhepe » Are Keloids Different Than Scars? Are Keloids Different Than Scars? Keloids tend to be larger scars than the wound edges themselves and are often described as having edges that spill over. On the other hand, hypertrophic scars do not have edges that spill over but do rise upwards. These scars can occur due to a minor injury (even from just from a pimple), or due to a more invasive wound. Any injury beyond the body’s healing capacity will be replaced with collagen tissue and then it is called a scar. Scars represent the original injury site and are generally limited to the original size of the injury. In simple words, it means that if you got a wound of one-inch size then the scar will be equal to or less than one inch. Certain individuals have some inherent defect in their healing mechanism. Their body over heals the original injury and the collagen deposition extends well beyond the original wound margins. Such automatically progressive scar is called a keloid scar. It not well understood why only a handful of people only get keloids and others do not. People with keloidal tendency have some defective gene that regulates control of wound repair process. Some, but not all have a familial tendency to get keloids. Darker the skin color, the more is the chance of getting keloids. So keloids sound pretty bad, right? Unfortunately, there’s more: if keloid scars are left untreated they can continue to thicken and grow indefinitely! This is another difference between a keloid and a hypertrophic scar, as hypertrophic scars do not continue to grow once they reach a certain point. In order to prevent keloid formation, we recommend using Needleless Technique by Enerjet JVR which is effective in treating a wide variety of scars. Hypertrophic scars are also raised, but they are rarely elevated more than 4 mm above the skin. They may be red or pink in appearance. The most important difference between a keloid and a hypertrophic scar is that hypertrophic scars do not grow past the original boundaries of the skin injury. Similar to keloids, hypertrophic scars are associated with adverse wound healing factors. Additionally, children and those with fair complexions and/or rosacea are especially prone to hypertrophic scarring. While there are chances that hypertrophic scars can go away on their own, it is best to treat this kind of scar to promote a faster and better recovery. With Skin City, there’s no need to be stuck with old injuries forever. Now enjoy smoother, clearer skin by treating and removing any leftover scars or damage. How To Lose Weight Without Getting Stretch Marks?